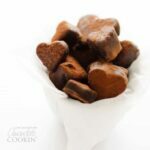 Chocolate Covered Fruit Truffles: a decadent treat for Valentine's Day! Alright, y’all, I’ve gone and made a HUGE discovery, and I’m so excited to share it with you. It involves: chocolate, fruit. End of list. We all know that chocolate-dipped fruit is a real winner, but what if we take it one step further? What if we cut the fruit into shapes then dip them into dark chocolate? Then dust them with cocoa powder? Well that right there is one of the healthiest, simplest Valentine’s Day gift if I ever saw one. Plus, they are just so cute! You can use virtually any fruit for the inside, and any chocolate for the outside. You can leave them plain, dust them with cocoa, or drizzle them with white chocolate. 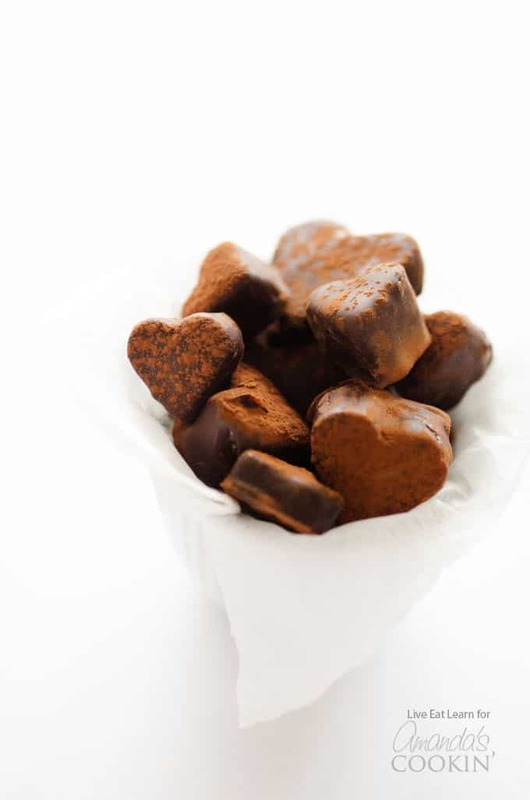 The possibilities are endless with these chocolate covered fruit truffles, and I think they’ll make the perfect romantic gift for your health-loving, chocolate-addicted significant other. Feeling the Valentine’s Day buzz? 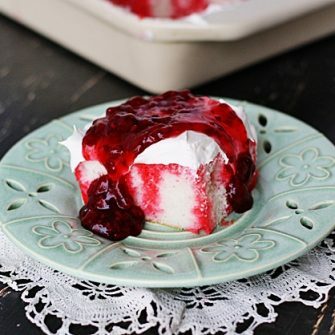 You must check out this Red Velvet Fudge, it’s a beautiful looking and absolutely delicious fudge recipe that everyone will LOVE! Also, you can’t go wrong with these Valentine Cupcakes. They’re a fun and easy way to say I love you to those who matter most this Valentine’s Day. Both recipes are awesome V-day gifts for teachers, spouses, friends or family! The idea for these chocolate covered fruit truffles came from these frozen blueberry bites I made a while back, which are just blueberries dipped in yogurt and frozen into addictive little snacks. 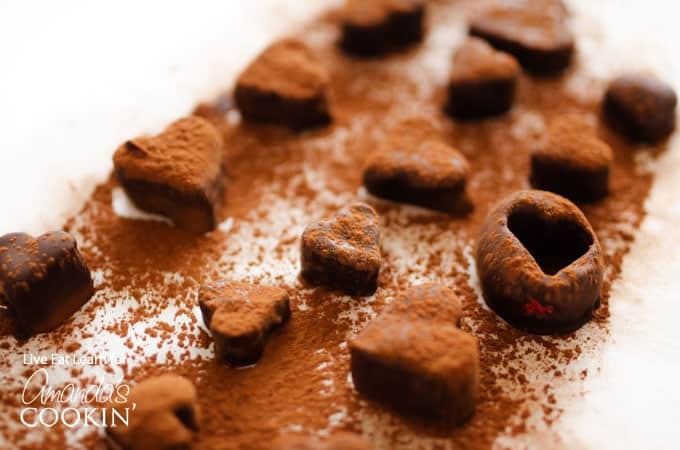 Sometimes the simplest way is the tastiest way, and that’s the case with these chocolate truffles as well! 3 cups fresh fruit strawberries, banana, pineapple, kiwi etc. 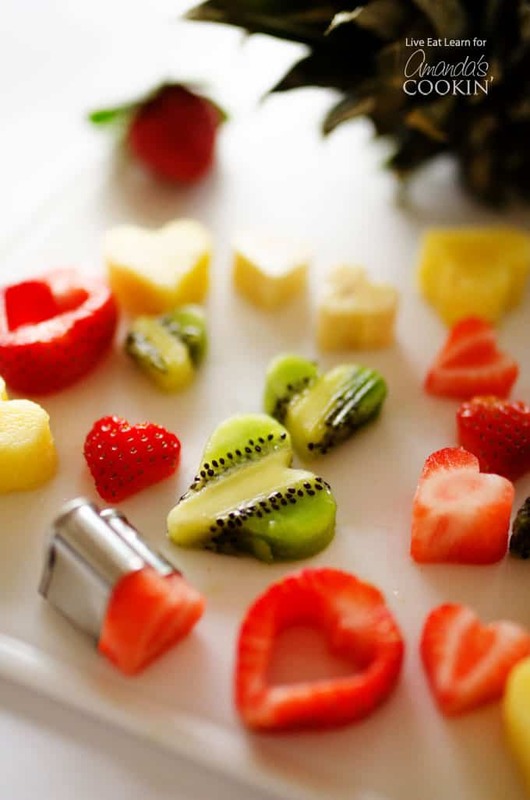 Slice fruit into ½ inch thick slabs then use a heart-shaped cookie cutter to cut into shapes. Alternatively, use a small melon baller to create ball shapes. Bring a medium pot of water to a boil, then shut off heat. 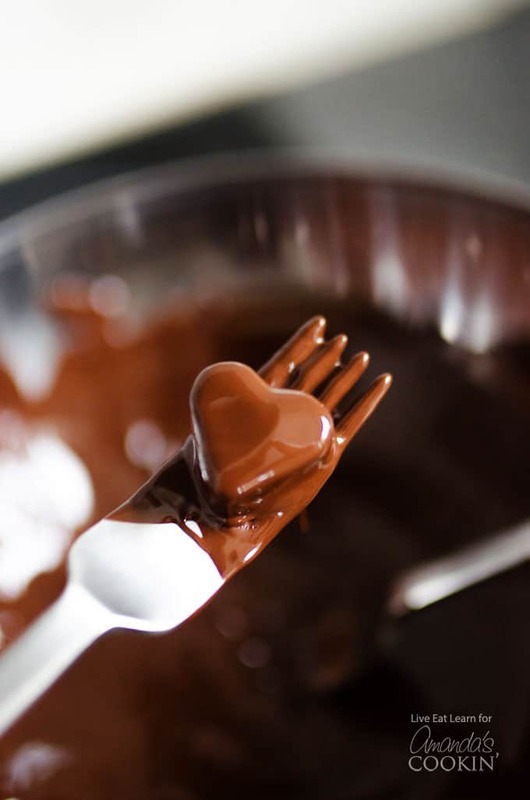 Place chocolate in a separate heat-proof bowl, and set on top of the pot of hot water. Stir until chocolate has melted. Alternatively, microwave the chocolate on low for 1 minute, stir, microwave for 30 seconds more, then stir until melted). Use a fork or toothpicks to dip fruit into the chocolate. Place on a parchment paper-lined baking sheet. Set chocolate covered fruit truffles in the freezer until chocolate sets. Optionally dust with cocoa powder, or drizzle with white chocolate. How long will these last last? Refrigerated or frozen.